Plumbing Vent Pipe Delivers Air | Vent Pipe Must Slope & Be Sized Right! "Plumbing vent pipe is very important and supplies air from the atmosphere into the drain pipes. 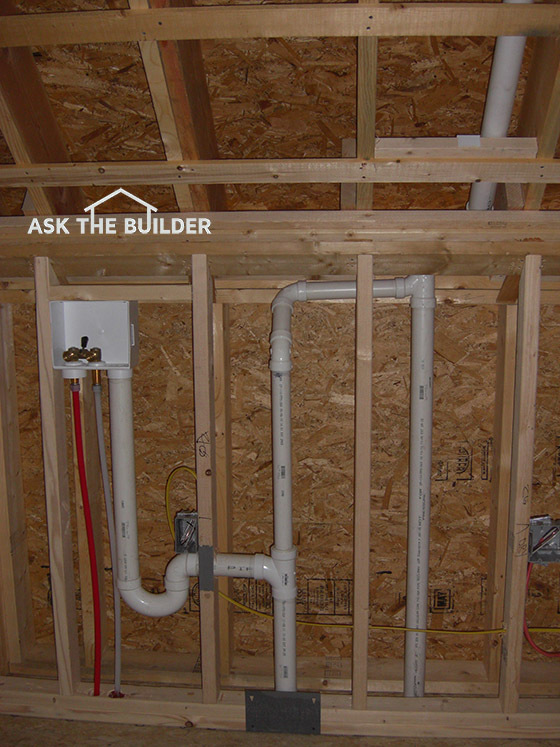 The vent pipes must have a slope to drain condensation water." WATCH my Vent Piping video below! DEAR TIM: I've got a remodeling project coming up and I intend to do the plumbing work. I'm good to go on the water lines, but the drain lines and plumbing vents are my weak spot. DEAR MANDY: You've asked for the impossible. I've been a master plumber since 1979 and I don't know if it's possible to do a Vulcan mind meld between you and me, but I'll give it my best shot. 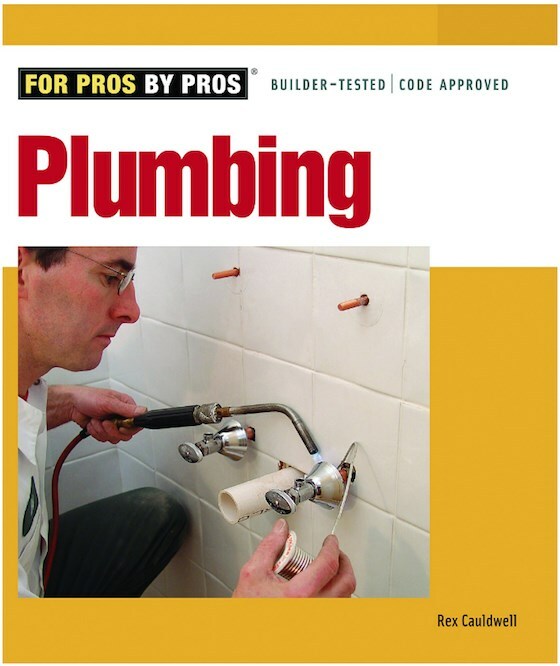 Plumbing vent pipes often confuse many, and even apprentice plumbers who are somewhat familiar with the trade often make serious mistakes when it comes to plumbing vent systems. CLICK HERE to get FREE & FAST BIDS from local plumbers if you want them to install your vents. Can I Install My Own Plumbing Vent Pipe? The first thing I want to mention is to make sure you check to see if you're allowed to install the piping. Some states and towns only allow licensed plumbers to do this work. The reasoning is based on public health. If you make mistakes when you plumb, you can get some people seriously ill or even cause death. For the most part, nothing about residential plumbing is that hard. If you're reasonably intelligent, you'll be able to do the work and grasp the physics principals that are involved. Rex is a peer plumber. 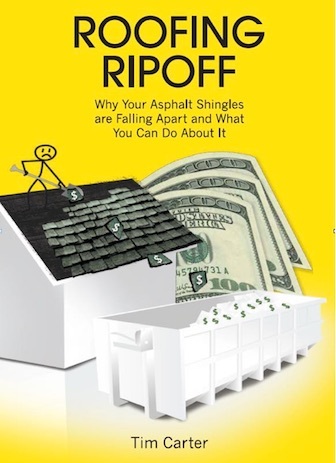 This is an exceptional book filled with tips. CLICK THE IMAGE NOW to have the book delivered to your home. What Happens When Water Flows Down Drain Pipes? Air is pushed out of the way when water flows down drain pipes. This air must be replaced and that's what a plumbing vent pipe does. It brings air from outside into the entire plumbing system. To help you understand the need for plumbing vents, let's talk about what happens in drain piping when water travels down through the system. In a properly designed plumbing drain and vent system, there is air in the pipes before water is poured down a drain or a toilet is flushed. As soon as you introduce water, and lots of it quickly, into a plumbing drain, the dynamics of the air changes. The water surging into the system displaces the air often pushing it down the drain in front of the rushing water. This air needs to be replaced so a vacuum doesn't form in the system. 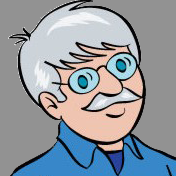 Are Vacuums in Plumbing Drains Bad? Vacuums in plumbing drain lines are bad, very bad. You've possibly heard a vacuum getting satisfied if you've been in a bathroom when a tub or sink drain gurgles when you flush the toilet. At a friend's house, this would happen every time his washing machine would drain. When the washing machine pump came on, his kitchen sink would gurgle and the water in the trap under the sink would be sucked dry. This allowed sewer gas to enter his house and vermin that are crawling around in the sewer lines. Yuck!! To prevent traps in downstream fixtures from being sucked dry like my friend's kitchen sink, you install a vent pipe, usually within 3 feet, close to the fixture trap. This vent pipe rises vertically towards the roof where it opens to the atmosphere to get the needed replacement air. What is the normal size of most vent pipes? It's important to realize a pipe that's 1.5 inches in diameter is sufficient to vent any residential fixture. But understand that some plumbing codes have very specific sizing requirements. If you start to collect vent pipes from other fixtures as you head to the roof vent, the pipes will have to get bigger, just as plumbing drain lines and building drain pipes get bigger the more water that enters them. Can a Plumbing Vent Pipe be Small? Vent pipes can be tiny and work. I'll never forget visiting a farm owned by another master plumber friend of mine. For fun, he vented all of the fixtures in a large bathroom with 1/2-inch copper water lines! Believe it or not, enough air was able to pass through that tiny pipe to satisfy each of the fixtures. It was just a simple experiment he did as he knew it would never pass an inspection. Lot's of air can pass quickly through a small unobstructed pipe. Should I Vent All Fixtures? To be safe, extend a vent pipe from every fixture. Certain fixtures can be wet-vented, this means two fixtures share a common vent, but since I can't be at your house to mentor you on this complex technique, just install separate vents for each fixture. Be sure any vent line that has to run horizontally actually has a tilt to it so any condensate water that forms in the pipe drains down to the sewer or septic tank. Are Studor Vents a Bad Idea? Studor vents, in my opinion as a master plumber, are a bad idea. They have moving parts and they will eventually fail. There are many things to avoid when installing plumbing vent pipes. I'm not a huge fan of the mechanical vents that you might install under an island sink or in some other location where running a traditional atmospheric vent is next to impossible. The common name for these vents is air-admittance valves. Can Ice Choke Off Vent Pipe Air? Yes, ice can choke off a vent pipe. It happens at my own home in bitterly cold weather. This ice is often called hoarfrost. Mandy, you live in a coastal area, so it doesn't get bitterly cold for too long. But if you live in an area that gets frigid for long periods of time, you have to make sure the vent pipe both above and below the roof is a large pipe, say 4 inches in diameter, so that it doesn't get choked off with frost buildup. I've seen this happen and it's almost unbelievable to think that ice could form in a vent pipe. It happens because the vent pipe sticking through the roof gets as cold as the air temperature. If the air temperature is cold enough outdoors, the water vapor traveling up the pipe can freeze right to the sides of the pipe. The ice buildup is the same temperature as the air temperature. Soon the vent pipe chokes off with ice. This happened to me here at my own home in New Hampshire the winter of 2015-16. I didn't build this house and the plumber just has a 3-inch vent pipe extending through the roof. It should have been 4 inches. Do I Need a Full-Sized Vent Pipe? Yes, full-sized vent pipes are a good idea. At least one of the primary 3, or 4-inch, drainage stacks should continue up and through the roof without changing the pipe size. Other smaller vent pipes from other fixtures can connect to this full-sized vent pipe. Avoid the temptation to eliminate a full-sized vent in your plumbing system. Some new plumbing codes are moving away from full-sized plumbing vents. I'm not a fan of this. A full-sized vent is a primary vent where the drain line transitions at some point and becomes the vent pipe that exits the roof. In many an older home, this drain pipe is perhaps 4 inches in diameter and stays that size all the way through the roof. Other vent pipes that are smaller may connect to this full-sized vent, and that's perfectly fine. You must have a plumbing vent pipe for each fixture in your home. 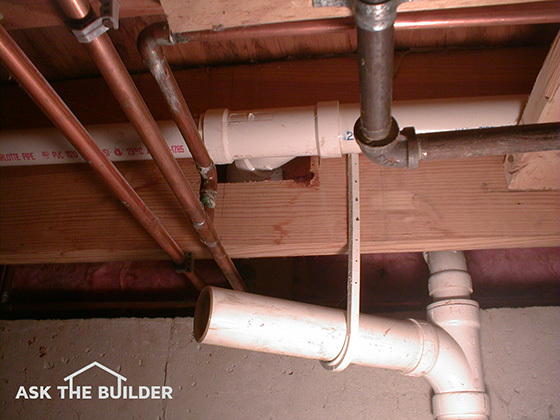 These pipes supply much-needed air each time water drains out of a fixture. Tim, we are having our bathroom remodeled. The plumber put in the tub and shower pipes but did not allow for enough distance for the fixtures to go on after tile was put on the walls. Does this mean a tear out of the tile or wall behind the tub wall? Is there a possible fix without this extreme measure? your question requires lots of typing, plus I have some questions for you so I can give you the correct answer(s). I only do pithy answers here in the comment section. If you want to protect the investment you have in your house and not waste time or money *hoping* you make the right decision, you should talk to me on the phone for just 15 minutes. It'll be the best investment you've ever made in your home! I am making a flat roof (deck patio) over an area where there is a black plumbing vent pipe. I woud prefer to cut it to size below the roof deck, put a 45 degree elbow on it and run the pipe out of the side of the building. Are there any issues with that? Jim, your question require lots of typing and I have some questions for you. You should consider investing in a 15-Minute Consult with me. Look at my cart for that. Lot's to discuss. I just do short pithy answers here. A Wet Vent System is allowed per code in GA, but do you think a properly installed wet vent system is acceptable or good? Thanks. Tim I have a shed and was wondering if I can vent a sink out of the side wall instead of the roof. You can run a vent pipe out a side wall. But you should have asked me if "I, Tim Carter" would do it. The answer is I'd NEVER personally run a vent pipe out of a wall. Always out of a roof. But you can do what you want. I think you mean can the vent pipe be "horizontal", right? If that's what you mean, the answer is Yes. But, all horizontal runs MUST HAVE a pitch so condensation water in the vent pipe DRAINS to the sewer or septic. Water can't collect in a vent pipe as it could eventually choke it off from the atmospheric air at the roof. Maybe there's a hair clog. That's the most common reason a shower or tub drains slowly. Don't pour peroxide down the drain, that's a waste of money. Just get the hair out. I have just had a home built in the late 60's gutted and remodeled. Against my better judgement I allowed the plumber to connect the new abs plumbing system (drain and venting) to the existing copper vent stack(s) to avoid working on the new roof that had been installed just prior to me puchasing the home. Now that the work is complete and the walls are all closed up I have an intermittent howling noise that have narrowed down to be originating from the area of one of the vent stacks in the house. All of the online info I can find describes a problem that sounds like mine however the cite the cause to be a clogged or backed up drain. As I mentioned all the plumbing is new so that is not the case. Is there anything else that could be causing the noise? I'd need more information to help you. This is phone call stuff, not back and forth in comments. I offer this MONEY-BACK Guarantee product. I have a vent pipe that suddenly had water start coming out of it and when this happened one of my toilets will not flush. Can you help me with this? Yes, I'd have to come to your home. I've never seen water shoot up from a rooftop vent pipe like a fountain and absolutely would love to see this! Hi I've got a problem with my drain pipe in the wash room when the water spins out of the washing machine and go down the drain it gets full and come back up. Well I tried using Drano liquid 3 bottles still nothing happened, a snake line was used to see was any blockage nothing happened, I even used a pressure hose but nothing happened the water still came back up. Do you have any helpful tips to use? I had a similar problem with the washer over flowing where it goes into the pipe. Before you do anything else there is a vent pipe like the one in the picture above. I'd recommend going in the attic and locating where the vent pipe goes. Buy a snake long enough to reach where the vent starts at the washer drain and go on the roof and snake the vent. After some time fighting this and calling plumbers, this was my issue. Im having the same problem but there is no vent pipe connect to the kitchen and I'm getting gas smell coming from sink and washing machine. It drains into a grease trap which I've cleaned but it its still happening. Vent pipe only connected yo bathrooms. Hi, I'm actually curious like Boysie. I'm having the same issue. I thought maybe it was the septic, but no other issues reported in the house (its been about a week). Coincidentally, this happened on one of the coldest mornings of the year (in IL). I thought maybe the vent pipe had ice formed, but could not see anything. Other vent pipes a few days later, I had noticed had ice formed on the cap early in the AM, but were not longer visible later in the day - no problems with showers, toilets, etc, only the washing machine. im remodeling a bathroom... the house is located in so. cal built 1955.... the old, galvenized vent pipe to the sink is 1 1/2 inches in diameter.It is wet vented with the toliet and pops out the roof transitioning to a 2 inch pipe along the wy.. At the tee (where the trap will protrude to the sink) the pipe transitions to a 2 inch drain pipe, that flows into a 3inch main line.. Question: I already cut off a section of old vent pipe, near the sink and transitioned to abs. replacing a santee and several feet of pipe also with abs before tying back into the old cast iron stuff. i did this as the old 60 year galvy and cast iron stuff was choked full of debris. Here is my concern/thought. A woman or possible two will be sharing that bath, (roommates) and i was thinking of coming out of the wall, at the sink. with a 2 inch trap as opposed to an 1 1/2 inch. but i will still have to reduce from 2 inch to 1 1/4 to feed up and connect the sink. The other alternative is to come out of the wall with a tee 2x2 x1 1/2 then kick the 1 1/2 down to a 1 1/4 again to get up to the sink. my thinking was a bigger trap, the horizontal point would less likely plug up but i've also read that a bigger trap holds more water which might prove harder to push down the line causing a stinkin sink. would either one or the other be advantagous or is it just 6 one way 1/2 a dozen the other? Follow up question: can i reduce the vertical section of pipe coming up from the trap to the the sink opening, (where the pop up will sit),from either 2 or or 1 1/2 to 1 1/4 inches, the latter, which seems to be the standard vertical size pipe i normally see,(in least in older homes) running from the sink hole into the trap?, (see above question) . As i mentioned there will most likely be 2 females shairing this bath which means a lot more hair into the pipes and im trying to do some advance planning. Here is the scenario: Recent heavy rains (flooding nearby), Main drain overflows, No noises prior to over flow and it is draining - extremely slow,I had the main line snaked by plumbers & they went 120 ft out & couldn't get it ; the city guy came out and said the line is 100 ft & their end is clear. I'm thinking that either the city guy didn't actually check or the vent maybe clogged. your thoughts? I'm not sure how or why, but I have a leak in a vent in the attic. The vent is venting the washing machine and runs about 10-15 feet with an upward pitch to the vent for a bathroom. The leak is in the 90 as it runs to a T that connects it to the "main vent". I can fix the leaking joint, but I can't figure out how water could be "climbing" it's way up a vent pipe, and enough to drip out and even cause minor ceiling damage??? Hi i am trying to hook the water line to my refridgerator but there is a 1/2 in. pipe with a cap i am having trouble removing. Does anyone have any suggestions? Ive tried twisting and twisting and twisting and pulling but it just wont budge need help please! I purchased a 1950's ranch last year. It's on a new septic system. We did a full bathroom remodel and put in all new plumbing including the vent pipe. We did a 4" PVC pipe. Now tied to this is the 1 bathroom (sink, toilet and shower), kitchen sink, and in the basement, on a pump is the slop sink and washing machine (which is older and uses a LOT of water). Well recently the smell of the septic seemed to have been getting worse outside in the yard. I purchased a filter to go over the vent pipe - nearly immediately the smell was gone and I was happy about that. But within hours, the septic sewer smell showed up in my bathroom. I went on the roof an removed the filter on top and the smell in my bathroom went away. Also at times, I will smell a little bit of the septic smell in my basement, more specifically the drain on the slop sink and/or the washing machine...almost like a bit of gas is coming back in. I can't nail it down...Any ideas? Hey Tim, I own a home built in 1957, a townhouse that for the life of me I can not find a vent line. I was told by a friend who's a master plumber that the main stack vents everything which is cool I guess except I want to put a bathroom in my basement and I am struggling with finding out how to do exactly that. everything drains into the basement floor via this stack. The system I am installing would be an upflush system that I know would need to be vented, but where would I vent it to? I've found my main stack, unsure where to connect the vent, could i tie it into the same stack above where i tied in the slurry from the upflush? I'm a master plumber among other things. I developed a product years ago for this situation - I call you on the phone to guide you through the situation. You'll need 30 minutes. CLICK HERE to place the order. MONEY-BACK GUARANTEE if you don't feel I helped you. I'm having a bathroom remodeling done. I'm 82 yrs. old...while the plumber was putting in my new in-wall medicine cabinet he ran into a vent pipe - black about 3 in. or more in diameter in the area the cabinet was to be installed. He said no problem..he would offset the pipe around the area to make it fit. Well I got to thinking about this and since it is a small job no permit was gotten! He cut the pipe, fixed it...never saw the results on what was done, he put the cabinet in, and now I'm worried about the off-shoot angle and whether it will collect condensation, or not vent properly...besides I don't know whether this is venting the toilet or just a vent? What should I do, this project has had so many complications from the flooring to the painting, etc. As long as the plumbing isn't making noise and it operates correctly, I wouldn't worry about it. Its to late to see the work. Maybe you could ask the plumber how he vented the pipes. 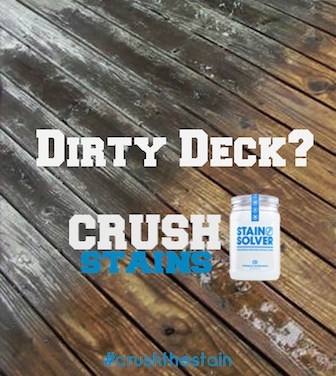 You wouldn't get any condensation unless the pipes were installed level without the proper pitch. Hope this helps. Hopefully the Plumber followed your local city Code for plumbing installation. Dropped a piece of 3in PVC pipe into the 4" Galvanized main drain stack, while replacing faulty piping. The PVC pipe is about a foot in length and is wedged in the main drain stack at least a foot down. How can I remove this? Will it eventually clog the drain, if not removed? I am installing a sewage ejector pump in my basement. I have everything laid out with the exception of the vent. I do not have the ability to run a vent to the roof and don't want to go out through the wall since it would be on the front of the house. I had a buddy who is a plumber look at it and he told me I can vent back to a vertical section of the main line which eventually does go out through the roof. My concern is he said use a sanitary T upside down which I agree would be okay if I did't have two bathrooms above it. I feel using a regular t would be a better option to avoid any discharge from the floors above entering the vent line to the sump. Am I wrong for thinking this? I'm a master plumber. You MUST do whatever is necessary to get a full-sized 3-inch vent from the ejector pit to the roof. PERIOD. No exceptions. I'm certain if I visited the job site I'd be able to make it happen. Hello Tim, my name is Kevin. I am converting our garage into a master bedroom with a master suite. I have a 4" drain line going to my septic tank that I've located and want to tie into. My question is in regards to where to "vent" my lines for the toilet, shower and sink. Can I email you the layout and where I was planning the vent system? You could tell me if this looks right. Yes. I'm a master plumber. 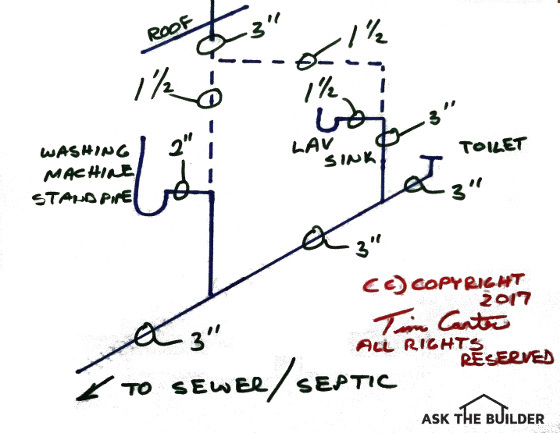 I routinely draw up plumbing isometrics for homeowners. I just did one last week for a man in Seattle. You'll need to order TWO of these as it takes a minimum of 30 minutes time. Hello Tim my namee is Ted. Checking over a home that belonged to my girlfriend who had a son living in it. It was a converted business building. There are no vents coming thru the metal roof. Checked under the sinks and they are all plumed into 3 inch PVC, stubbed out of the concrete floor. Has a 4 inch clean out going to the system. Go back up and re-read my column. Watch the video. Figure out where the vent pipe is. My name is Jill. I am a tenant along with husband and kids in the second and third floor of a house. The main bathroom has been smelling on/off for over a month. The smell comes out of the holes of where the pipes enter under the sinks and by the toilet. It does not come from the toilet seal although it is loose. The smell comes and goes but gets worse when the AC is on. The smell also comes out from between the wall and floor boards from the closet below the bathroom. Again most noticeable when the AC is on. The smell is not coming through the AC vents. Only through the space where the pipes enter and the closet. Is this sewer vent? My landlord insists it's a dead animal and has had wildlife take a look who said it wasn't an animal. He doesn't believe them. He got a plumber who said it's not sewage but all he did was look for water leaks. Again I asked about the sewer vent, the plumber said it's possible and the landlord would have to open up behind the toilet... today the smell was pretty bad so the landlord plans to replace the seal. I'm afraid it won't ultimately fix the problem. I'm no expert and all the experts seem to "not know". My daughter did drop a plastic Easter egg shell in our shower (master bath) in April. Is it possible that egg could have travelled and blocked the vent creating the smell in the kids bathroom? Please advise. I've learned a lot from your website which ultimately led me to think sewer vent...I'm hoping I'm wrong. I'm having frequent toilet clogging. I had my main line scoped a couple years ago and it was fine. I've sneaked it a few times with only temporary results. So I went up on the roof to check the roof vents, and I found a shower and sink vent that had a smaller piece of pipe crimped and nailed inside. I'd post a picture if I could. I can't think of an Earthly reason why it's there except to decrease the diameter of the pipe. My question is is there a reason ever to decrease the inner diameter of a vent pipe? Everything is backing up. House flooded on some floors and seeped in others, sewage entered the house in bathtub and toilet and floorduring Hurricane Harvey, I have had the city come and they cleaned their part but I think everything is so backed up I don't know if I can ever get it cleaned. The plummers are all busy. I am so discouraged, I don't think the mess can be undone. We found in our addition's attic a broken and shredded vent pipe. What could of caused that? We were having some leakage of sewer gas into our bathroom (its an older house). I noticed that one of the two vent for the bathroom was extended in the attic with an iron pipe. But, the extension was loose. So, I replaced that extension with a pvc pipe, and used a metal to pvc junction. However, it seems our smell is worse now. Do you have any thoughts? It seems to be worse when the heater is running. Thanks! 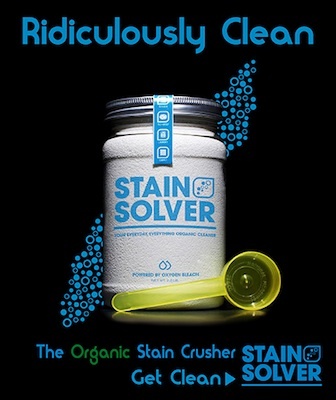 I solve all sewer gas odor issues over the phone. It requires lots of back-and-forth questions and answers. A vast investment of time. WATCH the short testimonial video there from a woman who I helped! My builder has only one vent pipe through the roof which I assume is 3” but I’m just not sure if that is sufficient for the entire home that has 3 bathroom with typical fixtures, washer/dryer and a kitchen. He says it’s all by the plumbing codes and he cannot rework on them due to time. What are your thoughts on this? I had a small building converted into living space for me. I had a small septic system built with 50 gallon drums just for the toilet. The kitchen sink, shower and lavatory drain through a 40' long lateral line into the pasture - which is very slow and gruggles as it is draining. Will cutting a hole in the pipe just out side the house and put in a short vent pipe help? Maybe. It's a long shot. You should have come here first before the plumbing went in.